I guess since my early college years I have been an addict of Salil's music. Of course in those days buying and collecting records was beyond my means. I started collecting his songs since the early '80s. Since then I have been painstakingly trying to collect Salil's songs, his poems, his short-stories, his plays, all his films in video and anything else I could get hold of, such as articles about him, reviews about his music, interviews with him etc. I met Salilda for the first time in the early '80s and since then I have been quite fortunate to meet him regularly in India and abroad and got to know him quite well. To me he was an inspiration, a teacher, a friend and above all the most talented and complete music director India ever had. He was also a wonderful person to be with. Highly intelligent with a wonderful sense of humour. His music filled my life with joy and made it richer. Salilda has left us now but I tend to believe that he has just moved to a distant address. Seems like I can still communicate with him through his songs and feel that he is still around us. I decided to create this website in 1998, three years after our Salilda left us. This website is primarily an archive but it also gives me the opportunity to share his music with everybody else. A major update to this website took place in 2000 and since then it has been continually updated. On this day, 96 years ago (1922) a musical legend was born and he changed the music for all of us. 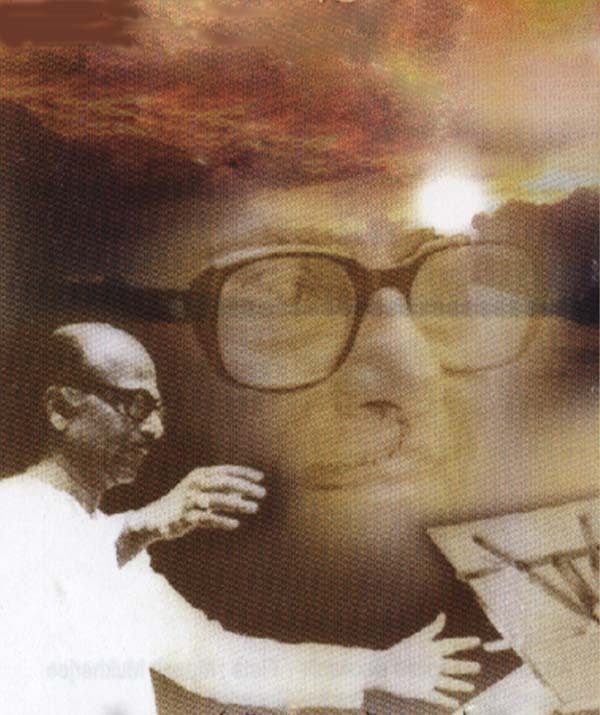 The only composer who composed over 1000 songs in 10 languages and is admired, respected and loved all over India. Besides being a talented lyricist and composer he was also a brilliant poet and a playwright. Thank you Salilda- we will never forget you - you will always be with us. We are proud to announce the release of the latest album of Salilda's unpublished songs he composed just before the Bangladesh Independence. These songs were composed in around 1971 and are part of an unfinished opera he was trying to create. The spool tape was preserved by a Salil admirer for over 37 years and these songs were recovered from that tape. This album is now marketed by UD Industries of Kolkata, India. In India it can also be ordered from Amazon.in. Please click on this link. Outside India it is available from washingtonbanglaradio.com and all the tracks can be digitally downloaded from their site. After nearly 12 years of searching followed by hard work we re-discovered many songs composed by Salil between 1944 to 1951. All of these songs were protest songs with strong political message. 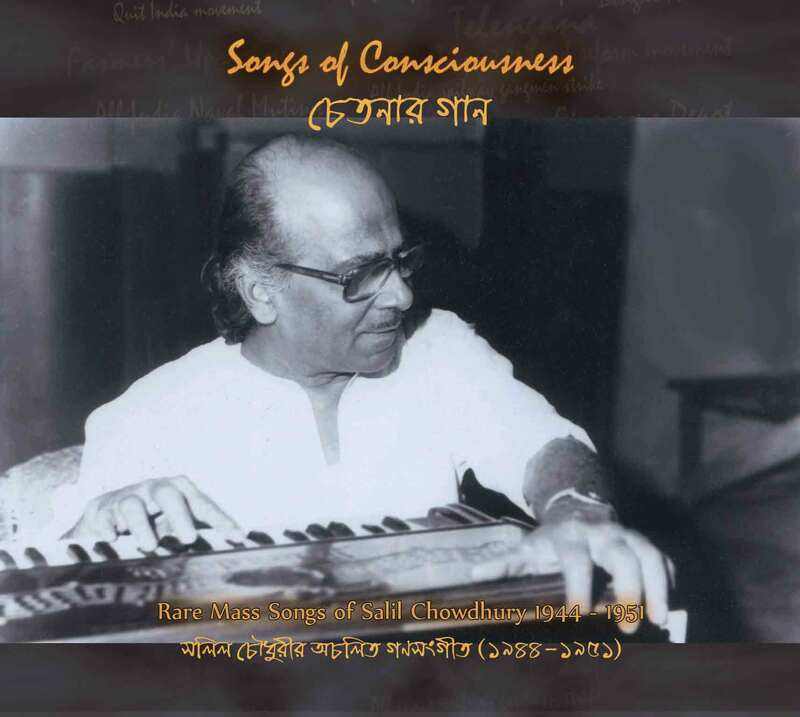 Salil called them "Songs of Consciousness". Some were recorded and most of us know those songs. But a large number of them were never released or recorded. Most were banned. In 2008 salilda.com decided to record 12 of these songs and this collection is now available. The principal singers are the members of IPTA and students of Rabindra Bharati University. It took us two years to complete this project. If you are interested in obtaining a copy of this collection please write to me. The album can now be ordered from Shubha Mudgel's site underscorerecords.com and all the songs are digitally downloadable from washingtonbanglaradio.com. It is also being marketed and distributed in India by UD Industries of Kolkata, India. In India it can also be ordered online via Amazon.in. Please click on this link. 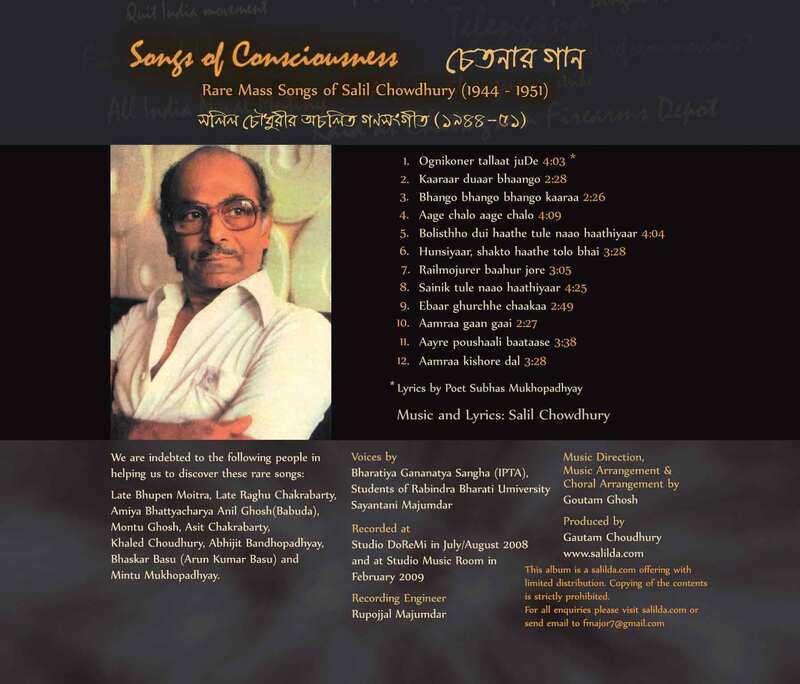 "Few Moments with Salil Chowdhury"
This is a "must read" Interview by Kalpana Biswas in 1978. Probably the most candid and frank interview of Salil till date. The original interview was published in the bengali magazine "Kaalpurush" in 1978. 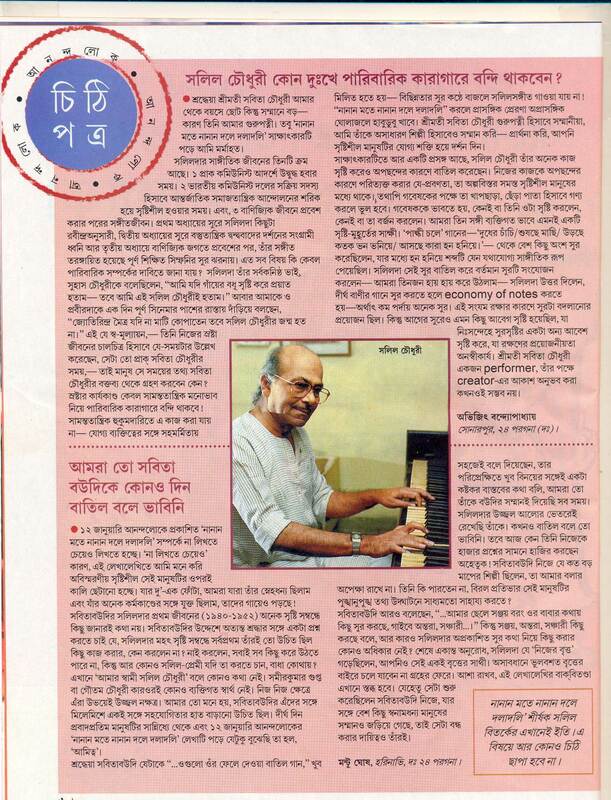 Recently Kolkata's most popular newspaper Anandabazar Patrika and the equally popular magazine Anandalok published two articles discussing salilda.com. It was good to see that 10 years after the launch of this website the West Bengal press has suddenly woken up and has taken notice. As a result I have been inundated with emails from many admirers of Salilda. Unfortunately in the Anandalok article our last 8 years hard work of collecting and trying to publish Salilda's unreleased songs from the '40s and '50s has been strongly critisized by some people. That is really sad. The journalists of both these publications have very kindly sent me the articles and I have decided to make them available for you all to read. Let me know what you think. Join the Salilda Fans Group in Facebook !